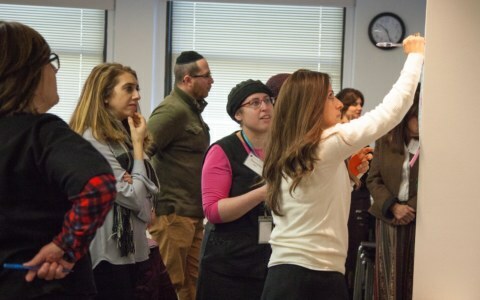 Since 2012, with funding from the Covenant Foundation, Hidden Sparks partnered with Shemesh in Baltimore, MD to introduce the Hidden Sparks professional development program to Jewish schools in the area. To date, with the support of Hidden Sparks, Shemesh has trained 14 coaches that serve 30 teachers in nine schools. 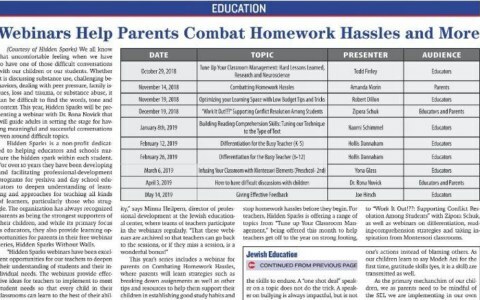 Over the last couple of years, hundreds of local children have benefitted from having Hidden Sparks trained resident resources on teaching to diverse learners in school such as Bais Yaakov, Bnos Yisroel, Ohr Chadash Academy, Talmudical Academy Elementary, and Krieger Schechter Day School. Shemesh serves the Baltimore community by providing the educational support necessary for Jewish children with learning differences so that they can reach their full intellectual, emotional, academic and social potential in a Jewish setting. 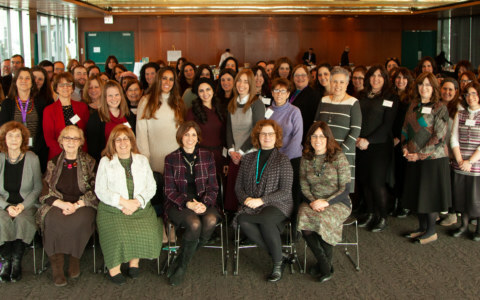 Also in 2012, with funding from the Covenant Foundation, Hidden Sparks partnered with Reach, a program of Jewish Child and Family Services in Chicago, to introduce the Hidden Sparks professional development program to the Chicago area. With the support of Hidden Sparks, REACH has trained 10 coaches who serve 30 teachers from three local schools, reaching hundreds of children in the Chicago area, in schools such as Chedar Lubovitch Hebrew Day School and Hanna Sacks Bais Yaakov. In the community, the Reach program specifically addresses children with educational disabilities, emotional issues and health concerns by providing specialized services in Jewish day schools in the area. Since 2015, with two years of support from the Jewish Federation of South Palm Beach County, and a grant from the Center for Innovation in Jewish Education, Hidden Sparks programs were brought to the five local day schools and yeshivas in Boca Raton, Florida, such as Donna Klein Jewish Academy. Internal Coaches in these schools were mentored and supported by a local senior Hidden Sparks coach, in a model similar to our New York program. Since 2018, as a result of an agreement with Catapult Learning, we are also able to provide services to schools in Broward County. Additionally, Hidden Sparks partners with individual schools across the country to bring our programs to their faculty. Call us to find out how to bring our program to your school!